Check out Tobi's Chilled Lace Up Joggers Lookin' to lounge? We are all in. The Chilled Heather Wine Lace up Joggers offer that rare combination of comfort and fashion. These comfy pants feature a high waisted fit and a corset closure. We like these lounge pants with a crop top and hoodie. These joggers have us running to the gym! Lookin' to lounge? We are all in. The Chilled Heather Wine Lace up Joggers offer that rare combination of comfort and fashion. These comfy pants feature a high waisted fit and a corset closure. We like these lounge pants with a crop top and hoodie. These joggers have us running to the gym! Lookin' to lounge? We are all in. The Chilled Heather Black Lace up Joggers offer that rare combination of comfort and fashion. These comfy pants feature a high waisted fit and a corset closure. 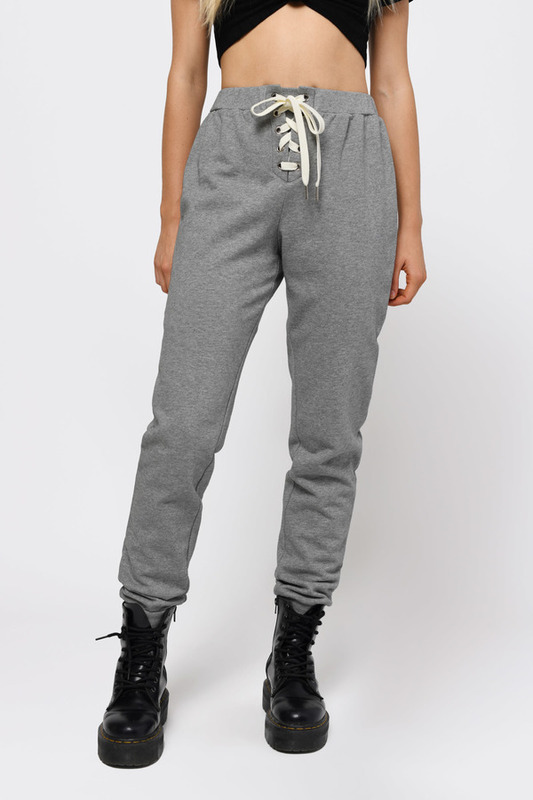 We like these lounge pants with a crop top and hoodie. These joggers have us running to the gym! Lookin' to lounge? We are all in. The Chilled Heather Heather Grey Lace up Joggers offer that rare combination of comfort and fashion. These comfy pants feature a high waisted fit and a corset closure. We like these lounge pants with a crop top and hoodie. These joggers have us running to the gym!